CLOUD, PILLAR OF ( , Ex. xiii. 21). When Israel was marching through the wilderness, Yhwh, wrapped in a pillar of cloud, preceded the people in order to show them the right way. During the night the cloud turned into a pillar of fire (Ex. xiii. 21; xiv. 19, 24; Num. xiv. 15; Deut. i. 33; compare Ps. lxxviii. 14; Neh. ix. 12, 19). On one occasion the pillar of cloud moved behind the Israelites in order to shield them from the pursuing Egyptians (Ex. xiv. 19, 24). The historic basis of this account is doubtless found in the frequently mentioned custom of carrying fire before an army on the march, so that the route might be indicated by day by the rising smoke and after nightfall by the light. When Alexander was marching through Babylonia and Susiana he gave the signal for his army to set out, not by trumpet, but by means of a long pole fastened above the chief tent, on which a fire burned by night, and from which smoke rose by day (Curtius, v. 2. 7). Thrasybulus, leading home banished men through untrodden regions, was preceded at night by a fire (compare Clement of Alexandria, "Stromata," ed. Colon, i. 348). In Arabia to-day iron vessels filled with burning wood are carried on long poles at the head of caravans (compare Harmer, "Beobachtungen," i. 348; Pococke, in "Morgenland," ii. 51). Since Yhwh is Israel's leader, and clouds and fire signify His presence (Ex. iii. 2, xix. 9), smoke and fire are transformed into cloud and firelight. The Haggadah, taking the words "I placed the children of Israel in tents" ("sukkot," Lev. xxiii. 43) in an allegorical sense as signifying that the Israelites were surrounded with clouds for protection, and the name of the city Sukkot (Ex. xii. 37, xiii. 20) as the place where they were covered with clouds (see Mek., Bo, xiv. ; Mek., Beshallaḥ, i. ), mentions not one, but seven, "clouds of glory" as having accompanied Israel on its march through the desert ( ); namely, one on each of the four sides, and one above, one below, and one in front of, these four. According to another passage there were even thirteen clouds, two on each side, two above, two below, and one in front. Others, again, speak of only four, or of two (Mek., Beshallaḥ, i.; Sifre, Num. 83). The cloud in front prepared the way by leveling the heights and depths (see Arnon), killing the snakes, and making the way pleasant. These "clouds of glory" prevented the garments of the Israelites from becoming soiled or worn during the forty years in the wilderness (Pesiḳ., ed. Buber, x. 32a; compare the parallel passages in Buber, l.c.). They were combined with the standards of the twelve tribes as follows: a strip of the seventh cloud, on which the initials of the names of the three patriarchs flashed in heavenly light, rested on the standard of the tribe of Judah, while a second strip of the same cloud, on which the second letters of the names of the three patriarchs flashed, rested on the standard of the tribe of Reuben; the standards of the tribes of Ephraim and Dan were similarly distinguished by strips of the seventh cloud. Hence the first strip of cloud bore the letters ; the second strip, ; the third, ; and the fourth, , the name of Abraham being spelled without the letter ה, and appearing on these strips of cloud as "Abram." This ה combined with ו and forming the name of God ( ), appeared on the pillar of cloud that hovered over the Ark of the Covenant. During the seven days of the week the pillar of cloud went the rounds of all the camps of Israel, giving light as the sun by day and as the moon by night. When God wished the Israelites to remove their camps, the cloud on which the letters were marked moved upward from the Ark of the Covenant. The four other strips of cloud followed after it, and as soon as the priests noticed these clouds following in the wake of the first, they blew their trumpets as the signal to continue the journey ("The Chronicles of Jerahmeel," pp. 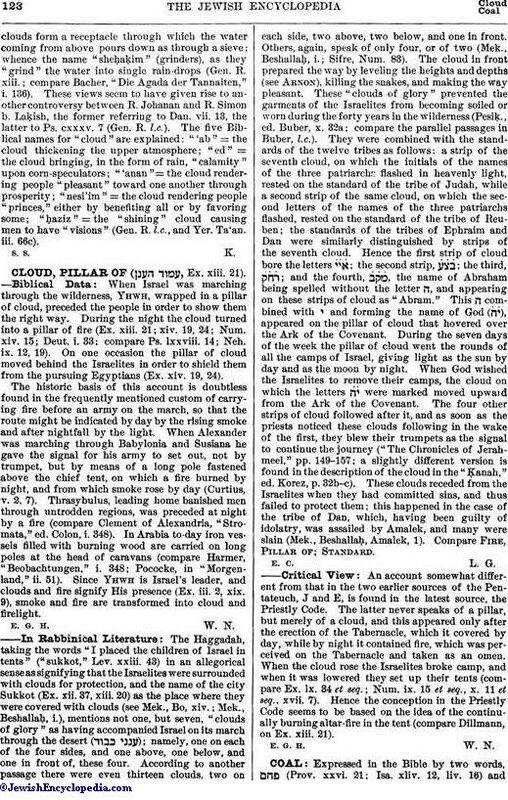 149-157; a slightly different version is found in the description of the cloud in the "Ḳanah," ed. Korez, p. 32b-c). These clouds receded from the Israelites when they had committed sins, and thus failed to protect them; this happened in the case of the tribe of Dan, which, having been guilty of idolatry, was assailed by Amalek, and many were slain (Mek., Beshallaḥ, Amalek, 1). Compare Fire, Pillar of; Standard. An account somewhat different from that in the two earlier sources of the Pentateuch, J and E, is found in the latest source, the Priestly Code. The latter never speaks of a pillar, but merely of a cloud, and this appeared only after the erection of the Tabernacle, which it covered by day, while by night it contained fire, which was perceived on the Tabernacle and taken as an omen. When the cloud rose the Israelites broke camp, and when it was lowered they set up their tents (compare Ex. lx. 34 et seq. ; Num. ix. 15 et seq., x. 11 et seq., xvii. 7). Hence the conception in the Priestly Code seems to be based on the idea of the continually burning altar-fire in the tent (compare Dillmann, on Ex. xiii. 21).